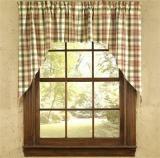 These Park Designs Apple Jack Gathered Swags have an adorable red and cream plaid. **THIS COMPANY DOES NOT PATTERN MATCH. IF YOU ARE PUTTING THESE ON A WIDE WINDOW, THEY ARE NOT GUARANTEED TO MATCH UP. This Wicklow Gathered swag features a Buffalo Check in either Red and Tan or Black and Tan Check.